Fleet van insurance, often known as multi van insurance, is aimed at businesses that own multiple vehicles. It offers wider cover such as allowing any driver to use any vehicle, which for some businesses, is a necessity. In some cases it will also allow driving by younger staff members. A few insurers can offer fleet insurance with as little as 2 vans, although the vast majority of fleet insurers prefer to quote for 3 vans or more. As always it pays to shop around and that’s where we come in, we’ll help you to find just the right cover for your fleet whether you have just two or multiple vans that you need to insure for your business at the same time. The real beauty of this type of blanket cover is that it doesn’t have to be just vans that you cover, the key here is the word fleet which can just as easily consist of a couple of cars and 1 van or any other combination come to think of it. The main purpose of this type of insurance is to ensure cover for two or more vehicles used by your business by a number of drivers. As the protection given by the insurance may end up being key to the survival of a business, it’s worth spending time looking closely at a range of insurance offerings to ensure the most appropriate product is purchased, which may or may not be the cheapest. Also consider that with some Insurers it is the Policyholder who must maintain the Motor Insurance Database, keeping it up to date with all the vehicle details of the company. If this is not done accurately and within a timely manner, the business could face a fine of up to £5000. Fleet van insurance or multi van insurance, whatever you want to call it, is often cheaper than insuring each van separately and certainly saves on the paperwork, but this is not always the case. For instance, if you have young, inexperienced drivers or drivers that have had disqualifications or penalties on their licence, then it is likely to affect the cost. That’s why it makes sense to use an online comparison site, such as this one, so you can quickly and easily compare quotes for both multiple vehicles as well as insuring each individually to ensure that you get the best policy for your individual needs. Find out how much you could save insuring your fleet in less than 5 minutes by completing our quote form below. Multi van insurance, as with any kind of insurance for vans, will have a multitude of aspects that you will need to consider that will affect how much it costs you. What kind of use can I get multi van insurance on? 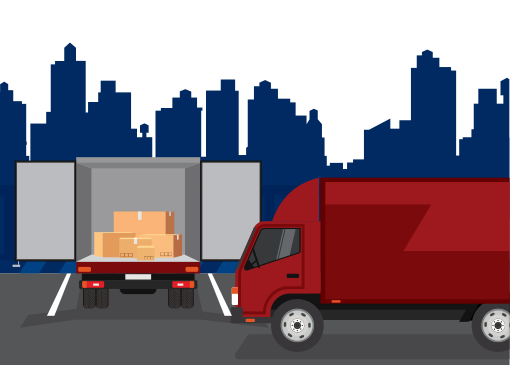 Most business activity can be covered by insuring your vans with fleet cover; however you need to stipulate what you use your vans for as some insurance companies won’t cover some businesses such as couriers. What additional cover do you require for your vans? Cover such as breakdown or vehicle replacement can be especially important if you are a business as even one van off the road can mean a loss of business. Make sure you accurately assess the right needs for your van fleet. What level of cover do you need for your multiple vans? As with any vehicle insurance you can opt for fully comprehensive, third party, fire and theft or just third party, so it’s up to you how you insure your fleet of vans. Just make sure that you don’t get the wrong type of cover. Although traditionally, when we think of multi van insurance, we tend to assume that there is a commercial reason behind it. However vans, single or multiple, can be the vehicle of choice for personal, social or domestic use too. For instance if you are a family of cycling enthusiasts, or any other hobby that requires carrying a lot of large equipment about such as canoeing, karting or surfing, then you may well have more than one van that you need to insure. So it’s good to know that you can use our comparison quote form to get a quote for your multiple vans whether you have just 2 or several. And don’t forget, if you are going long distances, that it’s good to share the driving so be sure to include any driver when filling out the quote form. Question: Can I get fleet insurance on 2 or 3 vans? Yes you can. Even if you have a mini fleet of vans, such as 2-5 vans, it can still be cheaper to insure all vans under one policy that covers multiple vehicles as opposed to having a single policy to cover each van and it is certainly a lot less complicated. However the more vans you have the cheaper it is likely to be as most insurance companies will offer a discount based on bulk. Question: Can I get insurance to cover drivers under 25 on my van fleet? Yes you can. If you have multiple vans and several drivers it is still possible to get cover for drivers younger than 25 although the more drivers you have under 25 will likely increase your annual premiums. Question: Can I get multi van insurance for pleasure purposes? Yes you can. If you have multiple vans that you use to carry your equipment around it makes sense to put them all under one policy. It’s likely to be cheaper and certainly less hassle for you. Always, always check that you’ve got the right cover for you and your vans. Fleet or multi van insurance cover can mean different things to different insurers.